It is not a common occurrence that we do a question-based review, but we believe that is the best form when it comes to Royal Vegas. That is how we will provide answers to the questions that players often ask about this platform. Once you have all the relevant details, it will be a piece of cake to figure out whether this website is the right one for playing games. Licensed: Licensed and regulated by the Malta Gaming Authority. Games: Slots, Jackpots, Table Games and Live Casino from Microgaming and Evolution Gaming. Is the Royal Vegas Casino a Safe Platform? The crucial thing that you need to ensure on an online gaming website is that you feel safe while playing. That includes protecting your personal and financial data, as well as being protected against potential fraud and data stealing. Royal Vegas is among those operators that never had a significant problem related to hackers. They implement all the necessary encryptions and safety precautions. The entire team of developers works on making the platform secure for thousands of players registered. 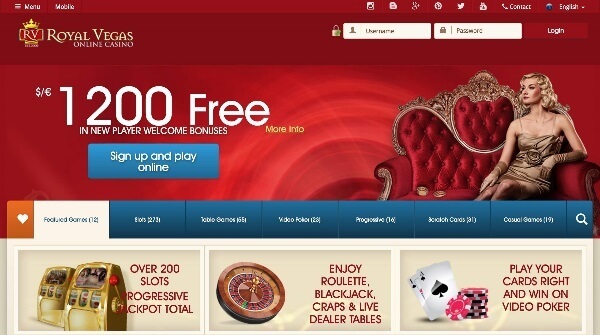 Is Royal Vegas Online Casino Licensed for Internet Gambling? If you head to the licensing page of the website, you will find that the Royal Vegas online Casino Canada has obtained licenses from two reputable authorities in the world of internet gambling. The first one is MGA – the Malta Gaming Authority, which is among the most reputable gambling entities in Europe. They guarantee that everything is fair and transparent, but to prove the players their trustworthiness, the company also acquired a certificate from eCOGRA. It is an independent authority that confirms all the games are transparent, and the operator ensures to deliver all winnings in reasonable deadlines. When you are a new player, it is essential that you can easily find the game that you want to try. Even if you are a veteran, you appreciate an interface that is easy to use and allows you to reach any website section in seconds. That is the recipe that Royal Vegas applied and succeeded. From the moment you find yourself on the homepage, you can choose different game categories from the listed sections. Whether you want to play slots, tables, video poker, or progressive jackpot games, you can access them via a single click. Aside from the numerous electronic software and classic casino games, the platform offers live dealer sessions with roulette, blackjack, and poker tables suitable for players of all ranks. It is interesting to note that the operator even offers games like Bingo and Keno once you feel like trying something different than usual. Some of you prefer the excitement of playing for actual cash, but others prefer to relax and play for free. Royal Vegas offers them that option as most of the games available on the platform can be played without investing any real money. You will, however, have to register for a free account. The reason why the company enabled free play is that they believe that is the best way for the players to see how the platform looks and feels. If you like a particular game, you always have the option of investing real money. However, nobody is stopping you from sticking to play money and enjoy your time. What If I Want to Deposit to the Royal Vegas Canada? Register for an account on the site. You need to provide basic information, but it shouldn’t take more than a couple of minutes. Head to the Cashier section. Choose the “Deposit” option and pick your desired payment option. Enter all the required information and finalize the transaction. Depending on the method you selected, the funds will soon be available in your account. We should also mention the supported payment options. It seems that all the major and most popular alternatives to make a deposit are at your disposal. The list includes debit and credit cards like MasterCard and Visa, as well as Skrill, Neteller, and Entropay. The same options are available if you want to withdraw money from your account. The fees may vary depending on the method you choose, so make sure to read the terms and conditions of the operator and your card or e-wallet issuer. What Are the Welcome Bonus Details? Royal Vegas is one of the most generous platforms out there when it comes to welcoming new players to their website. For the first four deposits that you make, they are willing to give you a 100% match bonus of up to €300. That means you can get up to €1,200 of extra money to play your favorite games. The wagering requirement is quite harsh as you need to play through the bonus details 50 times before the money becomes eligible for a withdrawal. For example, if you received €100 of bonus cash, you will need to play through it 50 times (50x100=5,000) to make the sum eligible to withdraw. Is There a Way to Play When I Am Not at Home? If you are impatient to play your favorite games and you cannot wait to get home, how about downloading the Royal Vegas casino mobile app and playing on the go? The website has a wonderful getting started section where you can choose your preferred platform to play. Apart from Windows and Mac, which are PC-based, you can also use iOS and Android devices. The site itself is mobile-friendly, but it is much easier to play if you download the app. The only thing you need to do is to choose the desired device on the Royal Vegas site and follow the simple instructions specified there. Keep in mind that the casino offers cross-platform support, which means that you can use the same account and login credentials regardless of the device you use to access the website. What Can You Tell Me About the Royal Vegas Customer Service? The last section in our Royal Vegas Casino review is dedicated to customer services. When you have a problem on the website, it is essential to resolve it as soon as possible. That will enable you to continue playing without affecting your strategy. The quickest way of reaching customer support is via the live chat. There are two different methods of accessing it – you can head to the contact section, but it is much quicker to click on the icon in the bottom right part of the screen. One of the agents should contact you in a matter of seconds, and you will be on your way to getting an answer to your problem. If you think that your problem requires a detailed explanation and chat is not the way to offer one, you can always send an e-mail. Keep in mind that customer service takes longer to answer when you use this contact method. It is also vital to note that you can’t reach the agents over the phone as that option is not supported. As a part of the Fortune Lounge Group that has years of tradition, it is worth noting that Royal Vegas has met and exceeded all expectations. It established itself as a reputable online casino that focuses on providing a seamless, but a premium experience to its players. If you would like to join the platform, feel free to complete the registration process and start playing today!